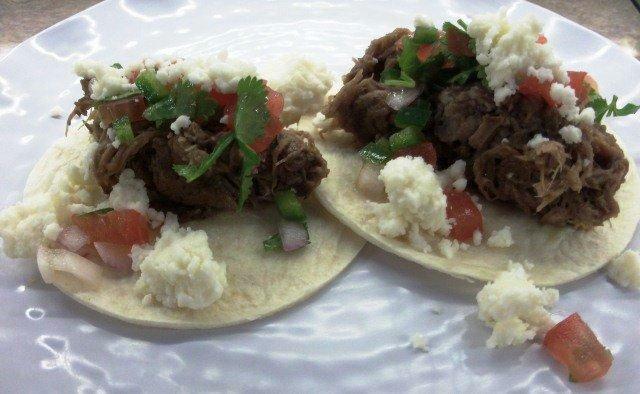 This recipe is my easy way of making beef carnitas in the crock pot. It really is easy and something different that you can have cooking as you are going about your busy day. You can also serve these at a party on a buffet, have different toppings that your guest can choose. I made mini flour tortillas to serve, by using a 3.5-4 inch round cookie cutter, you can get 4-5 rounds out of a large tortilla round. In crock pot add half the onions to the bottom, then place roast on top, then rest of the onions. In a bowl add all the rest of the ingredients and mix together, then pour on top of roast, cook on low for 6-7 hours. Remove roast, shred and set aside. Add to blender or food processor, all the good bits left in the pot (onions & chilies, leaving the liquid. Add only about ½ -1 cup as needed to make a thick sauce, add 1 tbsp. adobo sauce or 1 chipotle chopped if want more heat, blend again to mix. Pour over top of the beef and mix together. Serve with warm tortillas, pico de gallo, queso fresco cheese, sour cream, cheddar cheese, diced jalapeno etc., really what ever you want.